Join 25,000+ other freelancers and get the top 10 habits, lessons, and actionable tactics I've learned while freelancing since 2007. These lessons were HARD to learn but have earned me hundreds of thousands of dollars in additional profit over the last decade. They'll work for you too. Ready to take your freelancing game to the next level? Your email is 100% secure and will never be shared or spammed. These lessons were expensive and took me years to learn (painfully), but you can learn them for free in just 17 minutes. After entering your email above, you'll get the FREE ebook to download with all the lessons, so you can start learning right away! Listening to your experience and knowledge was invaluable. Knowing you started from the ground at a place where most freelancers do was encouraging...feel like it gave me a lot more confidence and knowledge in how to handle my freelance business moving forward. Working with Ryan has completely changed my business. 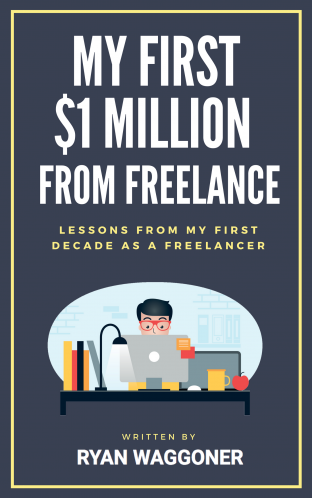 Within 4 months, I went from $0 in freelancing to $20,000 / month. Ryan has been extremely helpful in showing me everything I've needed to know to get up and running. I train freelancers to be unstoppable. I don’t teach your craft. I teach how to respect yourself as a professional, demonstrate your value, and charge accordingly. I train freelancers, consultants, and other solopreneurs to build healthy, satisfying, and sustainable businesses that earn at least $100,000 / year in profit. This is the guide I wish I'd had when I started. Sign-up to receive the guide for FREE and start growing your freelance business the smarter way! Copyright © 2018 IndieHive LLC. All Rights Reserved. Made with ♥ in NYC.